Users that have set the systray whitelist to tray will not be able to click on indicators directly right of the systray. 3. start an app that uses notification area. 4. test the indicators (like network indicator) cannot be opened. 5 now test the proposed unity and see the issue is not there. The children of the panel in the systray are now in a different data structure and the width is calculated differently. See attached screenshot. In the screenshot all the icons are indicators except for the Shutter icon (the left-most icon). I have added it to the whitelist. But when the shutter icon came on the panel, I can't click the mosque indicator icon in the area enclosed under the red rectangle in the image. If I want to access the mosque indicator, I have to click it's icon near its right edge (a very small area where it accepts clicks) or click on the Dropbox indicator or any other indicator on the right and move mouse leftwards. This problem goes away if I remove Shutter from the whitelist. FYI Shutter is the only application which utilizes the old-style notification area on my system. Unity 3.8.10-0ubuntu2 haven't fixed this problem for me. > Unity 3.8.10-0ubuntu2 haven't fixed this problem for me. > of a duplicate bug (764314). > other indicator on the right and move mouse leftwards. > notification area on my system. Bug isn't fixed for me either. I'm not a programmer, but I think if it was possible to get the systray to load first, before the indicator icons. it might work. Since restarting unity temporarily fixes the bug (until next restart), maybe adding the command to restart unity (unity --replace) at start up would solve the problem. Again, I'm not experienced in code. This bug also occurs to me, unity 3.8.12. When I add Shutter on the whitelist, some indicators such as battery and network manager does not respond when clicked. This occurs when changing the whitelist into ['all']. Logout & Login, then everything becomes normal. I just tried it on Shutter not in other applications. @Josh: Please don't change the status of the bug if you don't know what the statuses mean. You set the upstream bug task back to NEW, and now it can't be changed easily to Triaged as it needs someone with bug supervising privileges. Sometimes I have trouble clicking on things outside of the indicator applet as well. This is especially apparent in firefox, where certain links simply can not be clicked. The effect can be duplicated in Chrome and some gtk confirmation dialogs ("Ok" can not be clicked, but "cancel" can, for instance). When this happens, keyboard functions act normal. I am not sure if this is machine specific, and would be curious if this problem affects others on this bug report too. @Josh: Your issue seems to be an invisible window issue. Is there a properly defined rectangle area where clicks aren't accepted? Try moving the window out of that region and see if it accepts clicks. In any case, it isn't related to this bug. Everything's up to date on my system. It only occurs if there's a non-system applet on the left end of the tray. The indicator to the right of it is unresponsive to right or left click. Sometimes the next indicator to the right is semi-unresponsive, except on it's far right side. Also, sometimes all the indicators except for the power/logout menu become unresponsive. I can work around it by clicking a menu on the right and then hovering left or using the arrow key. The non-system applets have no affect on each other. It seems like it may get worse after a few suspend/resumes, but not sure. I've heard the plan is to eliminate the systray, but there's many very frequently used apps that don't work right without it, eg, Skype and Truecrypt. I hope they choose to fix it instead. I've set the whitelist to 'all' because it's not that bad in Linux, like Windows where every program wants to put something there. What's needed is a simple GUI where you can see the list of apps that want to use the systray and choose which ones to allow. Overall, though I thing NN is a step in the right direction. I'm having this same issue when adding to the auto-start icons that have old tray icons. However, if i do unity --reset, it gets fixed. Also, i setted the property to whitelist every tray icon for the panel as i need them. confirm that this occurs when changing the whitelist into ['all']. Confirmed. I changed the whitelist entry back to default and did a unity --replace, and the problem went away. list back to default is not necessary in order to fix the bug. > --replace, and the problem went away. It may be different on your system, but on mine I haven't had the problem since changing the whitelist entry back to default, and then manually adding apps I want to allow. I logged in and out, restarted the computer, whatever, and it's still good. If I change the whitelist back to 'all' the problem immediately comes back. Obviously, though, this is just a workaround and does not resolve the bug. What's really needed is a simple gui that lets you decide what entries to allow. I may try creating one myself. It shouldn't be too complicated, providing this bug is resolved. I have the same experience as #17. A unity --replace solves the problem, with or without changing the whitelist. I still haven't had the problem since changing the whitelist back to default. However, the left most icon is only responsive from the center right. The left side of the icon doesn't respond when clicked. So this is clearly some kind of boundary issue, which for some reason is worsened by using 'all' in the whitelist. Why this is temporarily fixed by unity --replace I have no idea. I have the same problem here, a unity --replace helps, but this shouldn't be standard procedure. just FYI: such issue can't be reproduced in unity-2d. just FYI: such issue cant be reproduced in unity-2d. just FYI such issue can't be reproduced in unity-2d. just FYI: such issue can't be reproduced in unity2d. should while the unity-panel indicators display this buggy behaviour. > of a duplicate bug (775224). ..... the indicators are clickable again. More systray (nonidicator) icons are there, more of the indicators is unclicable, whitelist 'all' just spread the nonresponsive area. with whitelist 'all' my indicators were unclickable for me except power button on far right but were scrubbable backwards from there. for me this appears to have been solved when i removed screenlets daemon from the tray. I have no screenlet daemon running and I see the problem. It is related with changing whitelist, definitely. Another couple of pieces of data from a non-programer: Adding "unity --replace" to Startup Applications seems to work for a while, but fails after a few hours. I've also tried "unity --replace &" in a minimized terminal (even with the Startup Applications hack going), and it seems to help, but after a few hours, I'm back to non-responsive indicators.Not sure what event causes them to stop responding. Note that I'm using Tilda, a Guake-style drop down terminal. Also, my volume indicator has disappeared. Unsure if this is related. Again, all this is just info for the bug hunters. I have the same problem, I have whitelisted all systray icon and I have 4 of them. I can't click on most of my indicator, I can click on those that on the right and if I click on the right side of the clock it work but if I click on the left side it don't. I can acces them by clicking on those on the right and moving my mouse hover the one on the left I want to access. It's not only left click because scrolling on sound indicator doesn't work either. Even after unity --replace &, some (standard) icons are not clickable. For example, bluetooth. It is as ever accessible by clicking on the rightmost icons and then scrolling to it. after login just the logout one is clickable. After doing the unity --replace trick, all minus touchpad-indicator and bluetooth are clickable. I am having the same issues sometimes. When I have it I'll click shutdown button in the right corner and scroll to left. This way I can left click every indicator. Has someone checked if this is fixed in the latest unity 3.8.16 ? BTW, they've added a ppa for unity (ppa:ubuntu-desktop/ppa). > BTW, they've added a ppa for unity (ppa:ubuntu-desktop/ppa). che: Yes I have tested the latest Unity from said PPA and the issue is still present. Hello people. I have the same problem. Not only with shutter, but audacious, monitor icon, printer icon, etc. It seems like this bug affect on any icon applet. The way to select it is to clic on the icon applet on the right and then move de mouse to the left this selection. Cant say if this bug affect on me from instalation, i noticed of that when use shutter. After that i probe with other aplications and confirm this behavior. The bug seems to have disappeared with the update I downloaded this week, I'm running now 3.8.16-ubuntu1~natty ... all indicators are clickable again. The update made no difference for me. 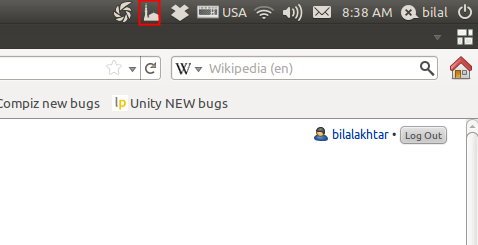 As soon as an old-style app indicator icon is added (KeePassX in my case), the left-most Ubuntu indicators are not clickable (Notes, Bluetooth, keyboard language selector, NetworkManager, Volume, Chat). The clock is clickable and I can drag across to the left to access the other icon's menus. I'm running today in a dual monitor mode (nvidia, TwinView mode). On my scnd. display, the additional indicators are not displayed and in this panel i can select all icons. In my 1st display, the buggy behaviour (and with the newest update). Have the same issue using 3.8.16-0ubuntu1~natty1 (unity) on amd64 Laptop Dell Studio 1537 when setting ['all'] to whitelist, meanwhile if use a specified application name insted it has no problem. It's like a general release bug since many people reported this issue. Please give priority :) and good luck! Confirm, not fixed in current Natty --- 32 bit install on an Asus eeePC. > duplicate bug report (764314). Running unity 3.8.16-0ubuntu~natty1 on x64 with nvidia TwinView, same problem on left main monitor. On the right monitor all indicator icons work fine. I.E, I allow all programs to go in the panel and not just the appindicator ones. isn't the cause of this issue the whitelist for systray to be set to 'all'?? @mbarak Yes, that makes a difference. If you individually whitelist the items in the indicator panel, then you'll not face this issue. A PPA with a possible fix is up at ppa:tspindler/unity-761409 . and logging out and back in again, I no longer see the problem where indicators become unclickable when using the fallback notification area and the dconf systray-whitelist setting set to 'all'. I do notice a slight overlapping of the area with the indicators once I have over six systray icons launched but the indicators are still clickable. The patch fixes it for me! number of people is affected. fixed for you without any regressions. slight mis-understanding with the names there, since we have the fix confirmed by Tom I have proposed the branch to lp:unity/3.0 myself. the updated ppa fixes the problem for me. I think i also saw it go under the desktop background when there were no programs open. Please re-upload without this extra file and we should be able to accept it into natty-proposed. Yes, probably just a sponsor flub.. it happens. you do know that mint does not have anything to do with unity don't you ? With ppa:tspindler/unity-761409 the Problem went away, but since 2 oder 3 days the problem came back. What the heck is going on there. That's far away from a usable system. I know now, why Linux only has 1% users on the desktop. Right now I have to be very careful not to close Clementine or Pidgin or Amule windows because the tray icons are not only not clickable - they are also not showing at all (to get them to show I have to restart Unity - but after a few minutes they disappear again). My report about it was ignored. Ubuntu 11.04 right now is simply not usable - I manage only because I'm a "techperson" and can workaround almost every obstacle. But the 1% will fall to less with the mess that is the most popular Linux distro. I stopped recommending Ubuntu to people - more, I have to recommend to them other systems right now (Windows 7 is quite nice for example). Also right now the launcher is flickering when I watch movies (partially visible on all full screen apps). It's annoying as hell. does anyone know if this reached natty-updates yet? The problem is back again! But in other machine... (before in dell mini 1012, now in sony vaio serie Y) I added the ppa but the bug is still there. Any sugest for manual configuration of the famous "white list"? unity | grep Version' and let us know the result? Thanks. Ok, my question is auto-answered with my tests: it works to me! :-) Thanks. Sorry but it still fails. I have to click several times to the left-most indicator on panel works. It works for a while but then it fails again. @Edvinas: I've rebased the package in ppa:tspindler/unity-761409 against 3.8.16-0ubuntu1~natty2 and the packages are being built now. @Tom, @Simon: It seems there was no update with the patch included for Natty yet. Maybe Omer has some information on the upgrade process. A package in -updates superseded the package in Torsten's PPA, so the package got updated. The update didn't contain the fix for this bug. Torsten's new version includes the fix based on this newer unity version. It seems although it's been merged into lp:~ubuntu-desktop/unity/natty it has not yet been pushed into a package for -proposed. I've added his PPA and I'll test now. The modified Unity in Torsten's PPA worked well. I'm not 100% sure if it's related to this bug but since I upgraded to unity 3.8.16-0ubuntu1~natty3 I have trouble with my external LCD screen. I can get to the login prompt but once authenticated, the screen goes black. When this occurs, I still can have my display back if I unplug my external monitor, my laptop's screen goes on and all work fine on this screen. @Magnes, please let me know which bug you reported as I'd like to subscribe to it. Thanks. https://bugs.launchpad.net/unity/+bug/823099 - it's a little different, but the problem is probably the same. I hope it's already fixed in 11.10. Please disregard my comment in #89 as downgrading to 3.8.16-0ubuntu1~natty2 didn't help. still not fixed for me in 11.10.
can that ppa be used in 11.10? where there are 2 battery indicators, i didn't notice the duplication at first. Sometimes the "old style" tray icons don't respond.